Where Can I Get it? | How Should I Eat It? What are liquid nitrogen puffs? What is Dragon’s Breath? Are they the same thing? 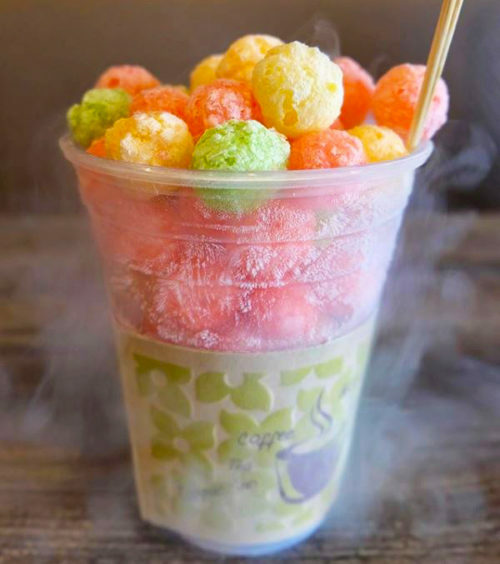 Liquid nitrogen puffs are a novelty dessert made of fruity cereal puffs or other light and airy snacks (e.g. 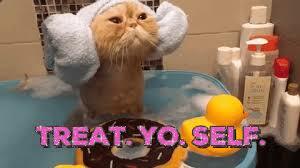 popcorn, marshmallows, wafers, whipped cream, cheese puffs, etc.) soaked in liquid nitrogen. 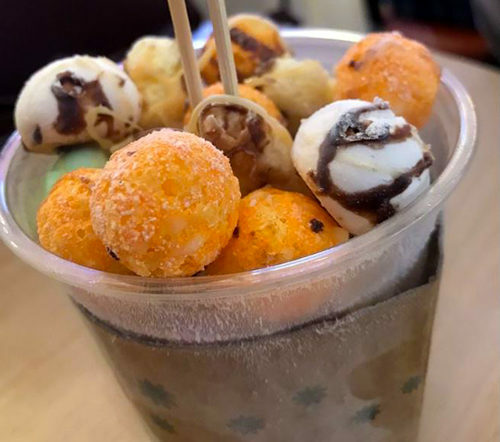 This Instagram-friendly snack goes by many names including: nitro puffs, nitro snacks, nitro pop, nitro balls, dragon nitro puff, dragon puffs, dragon balls, dragon smoke, snow balls, liquid nitrogen snowballs, liquid nitrogen candy, Heaven Breath a.k.a. Heaven’s Breath, and most commonly, Dragon’s Breath. Dragon’s Breath was originally invented and served at “minibar” by José Andrés in 2008. After Andrés stopped serving it at his LA restaurant “The Bazaar” in 2009, it spread throughout Taiwan, Korea, and the Philippines over the following years. 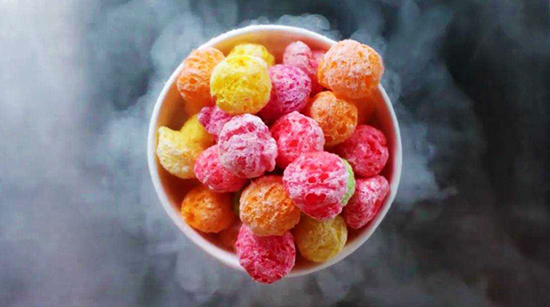 The term “Dragon Breath” was trademarked in the US in 2017 by Chocolate Chair and now specifically refers to the liquid nitrogen-infused fruity cereal puffs sold by Chocolate Chair since 2016. So technically, you can’t get Dragon’s Breath anywhere else. Remember how “cronut” was trademarked back in 2013 by its inventor, Dominique Ansel, so other places with similar items had to use alternative names like croissant doughnut, doissant and doughsant? Yeah, it’s kinda like that. 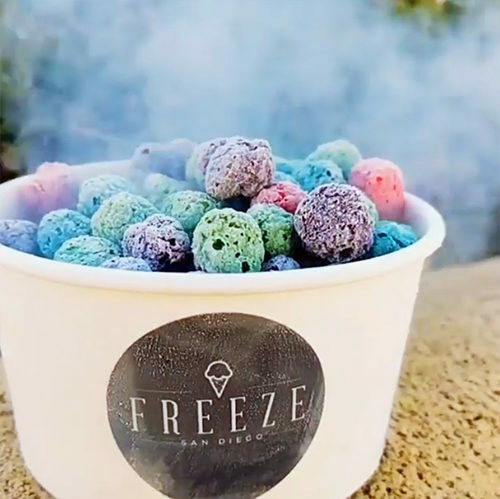 The flavor of these hyper-frozen snacks can be very mild since the liquid nitrogen itself has no flavor, but the fruity cereal version tastes like Froot Loops, Trix, or Cap’n Crunch. It may be accompanied by flavored dipping sauces to add more taste to the cereal. When eaten and exhaled, this seemingly smoking dessert releases as a thick fog mimicking a dragon’s breath releasing smoke from the mouth and nostrils. “The Culinary Miracles of Chef Jose Andres” 60 Minutes. CBS. 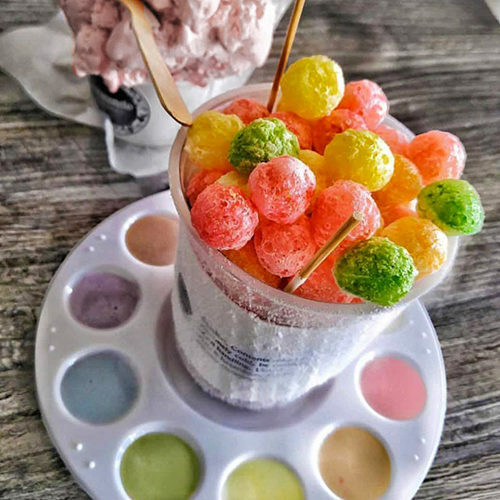 Many places that serve liquid nitrogen ice cream and desserts have expanded to serve liquid nitrogen puffs. Also, plenty of mall kiosks across the country serve some variation of liquid nitrogen puffs. 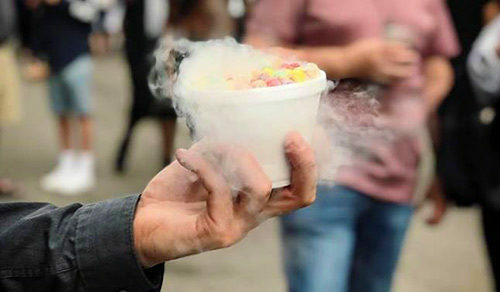 However, certain fly-by-night places may serve this snack without being educated about the proper safety serving techniques—the most important being that there should not be any liquid nitrogen remaining in the container when served. Here are some locations that have been known to safely prepare this “smoky” snack. 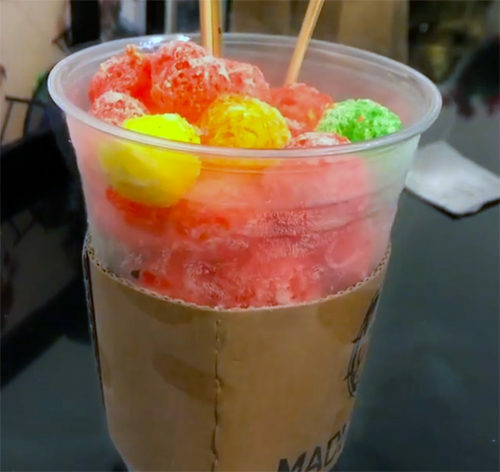 Looking for more places that serve liquid nitrogen puffs like Dragon’s Breath? You can find them on Glutto right here. 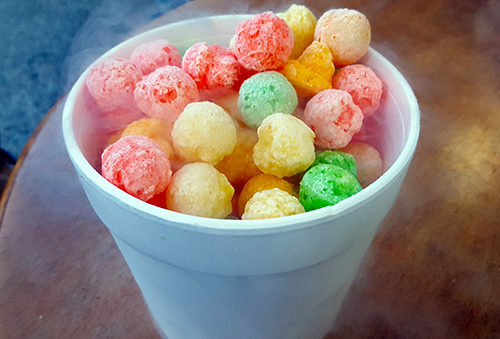 Are liquid nitrogen puffs like Dragon’s Breath safe to eat? Yes, but only under proper preparation and supervision. 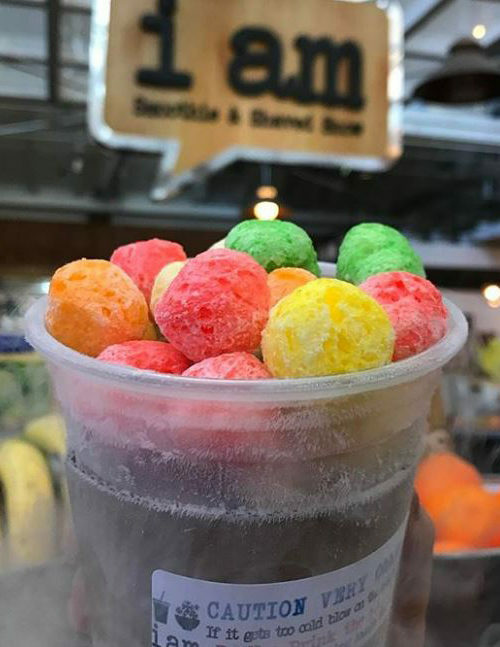 When prepared properly and eaten responsibly, foods and drinks made with liquid nitrogen including liquid nitrogen puffs and Dragon’s Breath are not dangerous. Liquid nitrogen is non-toxic. The main reason for concern is its extreme temperature. However, thanks to a scientific phenomenon called the Leidenfrost effect, a cushion of gas provides a protective layer when the liquid nitrogen briefly comes into close proximity to your body heat due to the high contrast in temperatures. But in any case, direct contact with liquid nitrogen should be avoided. The main point is that liquid nitrogen must be fully evaporated from the meal or drink before serving. It can safely be used in food or drink preparation, but it should not be ingested. Keep in mind, serving liquid-nitrogen infused foods is unregulated. Thus, not every place is educated in the proper serving techniques. Due to certain places improperly handling this snack, a few customers have suffered oral injuries and respiratory problems. In August 2018, the FDA released a public advisory as a precaution. In the advisory, they state that customers should avoid eating products prepared with liquid nitrogen at the point of sale. Furthermore, the “smoke” itself may visually appear similar to smoking or vaping. However, the composition of the “smoke” released by foods with liquid nitrogen is not the same as what is released from a cigarette or e-cigarette. It is similar to fog and is primarily composed of the condensation of water vapor in your mouth (like your breath on a cold day). How do I eat it safely and responsibly? Eat this cryogenic snack the same way you would eat really hot food…slowly and carefully. It’s very, very cold (even colder than dry ice). So, pick it up with the stick provided (not your hands) and blow on it if the temperature is too extreme. Just as you wouldn’t fill your mouth with hot food because it would burn your mouth, you shouldn’t fill your mouth with freezing food because it could cause frostbite. If you have cavities or sensitive teeth, leave it on the stick so you can still play with the fog while your breath gently warms it up. Otherwise, if you chew it immediately, you may feel a painful stinging sensation in your teeth. Make sure to eat your Dragon’s Breath and all types of liquid nitrogen puffs in small amounts. This allows your mouth to naturally heat up again between each bite. Eating it too fast or in large amounts could cool your mouth to the point of discomfort or pain. Finally, completely breathe out the vapors for a dramatic visual effect. In the end, as long as you pace yourself when enjoying your liquid nitrogen puffs (and don’t have any respiratory issues), you should have nothing to worry about except perfectly capturing your dragon breathing skills on camera. 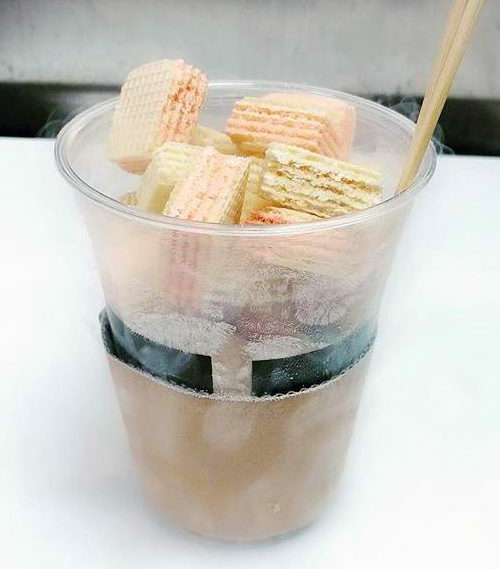 We don’t recommend making liquid nitrogen-infused snacks like Dragon’s Breath at home because liquid nitrogen can be dangerous when handled improperly. However, if you (or someone you know) knows how to safely and responsibly handle liquid nitrogen, here’s a recipe on how to do it. While wearing protective gloves and eye wear, slowly and carefully pour the liquid nitrogen over the cereal so it is completely soaked in liquid nitrogen; wait for the liquid nitrogen to evaporate. Use a skewer to pick up the cereal and pop in your mouth. Gently chew and exhale to breathe like a dragon! It is never safe to directly eat or touch liquid nitrogen in any way. Think of it like fire. Both fire and liquid nitrogen are sources of extreme temperatures and can cause a lot of harm. However, when handled properly, it can be used safely and reliably for food. If you have asthma or any type of breathing-related issues, please avoid ingesting any liquid nitrogen-related foods or drinks as they may potentially lead to an asthma attack. Liquid nitrogen looks like steamy water and may appear harmless, but it can quickly freeze whatever it touches. Although the fog is safe, the actual liquid is not due to its extremely low temperature. So, make sure to never directly come into contact with or ingest liquid nitrogen and leave the freezing to the food. Enjoy responsibly! please contact for whole sale inquiry for dragon breath ball.